Finding fabulous fall foliage in Georgia couldn't be easier ... with the new "Leaf Watch 2012" website created by Georgia's State Parks. If you're one of the zillions of folks roaming around Georgia to "look at the leaves" -- instead of watching football -- I have good news for you! "Leaf Watch 2012" will keep you posted on where you can find the most beautiful fall foliage. Whether hiking, biking or simply driving country roads, travelers can check Leaf Watch 2012 for advice on where and when to find the best color in Georgia's state parks. There will be updates from park rangers, safety tips for hiking and event calendars. Last-minute availability for cabins, yurts, campsites and lodge rooms in the state parks will also be posted. 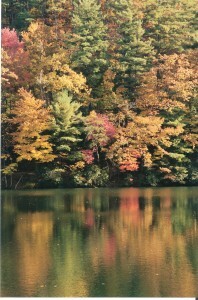 Typically, North Georgia peaks in late October, but color can be seen as early as September and as late as mid-November. The best way to track changing leaves and plan autumn getaways is Leaf Watch 2012 from Georgia's State Parks. Click Here (in October) for Leaf Watch! Georgia has nearly 50 state parks, providing affordable "staycations" to residents and a not-so-far-away mountain escapes for Floridians. Park rangers advise guests to make reservations as soon as possible. It is not uncommon for the most sought-after cabins to be reserved 13 months in advance, and many campgrounds fill up early on pretty weekends. Reservations can be made by calling 1-800-864-7275. Or Click Here for Reservations at GeorgiaStateParks.org. The Fall Festival in Narrows, VA, takes place on Saturday, October 29th from noon - 9 PM. There'll be dancing in the streets, good food and great trails. Make plans now to attend the Fall Furnace Fest in PA's Pine Grove Furnace State Park, and visit the Appalachian Trail Museum while you're there.